Myalgic Encephalomyelitis (M.E.) is a severely debilitating fluctuating neurological condition that affects 17-30 million people worldwide. People living with M.E. experience a wide range of symptoms but tiredness is the one symptom that the general public know about. This is partly because M.E. is also known as Chronic Fatigue Syndrome (C.F.S.) in many quarters. This name has caused so many problems in our fight to get M.E. understood. C.F.S. was the name coined by the Center for Disease Control (CDC) in response to a “chronic flu-like illness” outbreak around Lake Tahoe in the US in 1985. The ridiculous fight to get a universally accepted name for our illness is what makes M.E. unique, our condition is so complex it is hard to clearly define it with one name. What does Myalgic Encephalomyelitis actually mean? In a nutshell, it means muscle pain with brain and spinal cord inflammation. This inflammation is what makes M.E. a neurological condition; it affects every system in the body. There are over 50 recognised symptoms, each M.E. sufferer will experience their own unique range of these symptoms to varying degrees of severity. Symptoms include: Extreme fatigue, pain, cognitive issues such as memory loss: concentration issues: and word finding abilities. IBS, sensitivities to light, sound, and smell. Issues with temperature control, skin rashes, slurred speech, food intolerances, migraines, and headaches to name a few! So much more than just tiredness. In the UK, 250,000 have been diagnosed with the condition, but there are many thousands more who are still going through a long drawn out period of diagnosis. M.E. does not show up in any routine test and so we are diagnosed by our symptoms. The routine tests we are sent on by our GPs rule out every other possibility, we are diagnosed with M.E. when there is nothing else left that it could be. This is why it takes so long. It is rare to come across a sufferer that has waited 1 year or less to get a diagnosis in the UK, in many cases these patients have received private treatment. Many patients are given the vague label of C.F.S. by their doctor but identify themselves as M.E. patients (They do their own research and discover they match the 7 key indicators of M.E.). Unfortunately, many people believe that getting a diagnosis is the end goal; that getting a diagnosis makes everything better, treatment would naturally follow the diagnosis and we would be able to get on with life as normal. How wrong can we be?! There are no effective treatments for M.E. There are pills and potions for each individual symptom but not for the actual M.E. itself. Psychiatrists would have us, and importantly you, believe that it is all in our heads and so can be treated with therapy and exercise. This has caused the M.E. community so much distress and harm. The core feature of M.E. is that exercise exacerbates our symptoms. Even climbing up one flight of stairs can make some sufferers bedbound for days, if not weeks. So, to suggest that we can get better through increasing our activity is absurd and extremely harmful to M.E. patients. This is yet another aspect of M.E. that is argued about worldwide and is very complicated!! A widely accepted diagnostic criteria can be found below. Seven key indicators for making a diagnosis of M.E. Post-exertional malaise or symptom exacerbation: a key characteristic of M.E. Symptoms worsen significantly after activity has taken place. This reaction can be felt on the same day but also after a delay of 24-72 hours. Exercise-induced muscle fatigue: which may be accompanied by muscle pain. Cognitive dysfunction: Problems with short-term memory and working memory, concentration and attention span issues, and word finding abilities. Pain: Can be persistent and difficult to control. Pain can be muscular, rheumatic or neuropathic. However, a significant minority of patients experience little or no pain. On-going, flu-like malaise: A general feeling of ‘being unwell’ that is accompanied by sore throat, tender lymph glands and problems with temperature control. Autonomic symptoms: including orthostatic intolerance. Autonomic symptoms are very common in M.E, and orthostatic intolerance refers to difficulties remaining upright. It is incredibly difficult to diagnose M.E. because not every patient has the same M.E. experience. Levels of severity are different, symptoms are different, some have pain whilst others don’t. There is no ‘one size fits all’ template to guide medical professionals. Sally and Foggy suggest that you check out these charity websites for further, in-depth information about M.E. 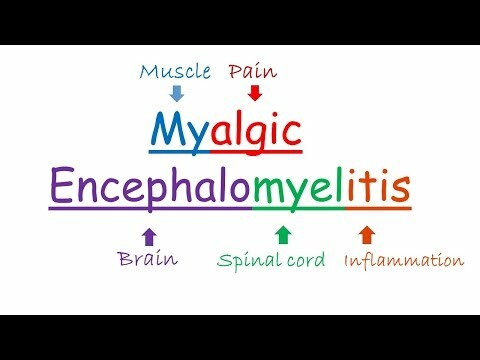 Here’s a video that helps to explain about M.E.